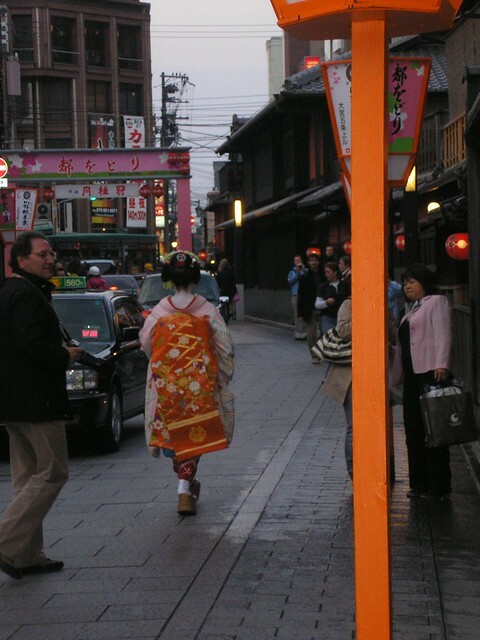 Dressing up as a maiko or geisha is very popular among tourists and, as you must know from my blog, I did it myself back in 2006 on my first trip to Japan. I went to a studio called Yume Koubou, and went to their Kyoto Eki-Mae Head Studio just to have photos taken (not to walk around, as you can at some studios). The price today is ￥9,975 (about £75), which includes a CD of all the photos. I think it was about that much when I did it six years ago, and it was absolutely great value for money. I’d do it again any day! 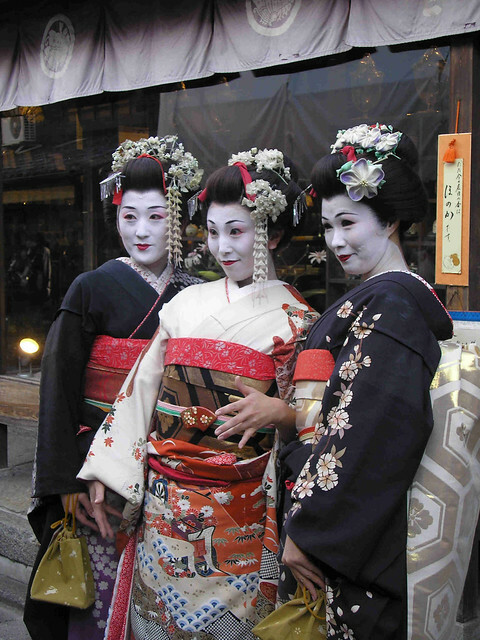 The word ‘geisha’ literally means ‘art person’ or ‘performing artist’ and ‘maiko’ means ‘dance child’. 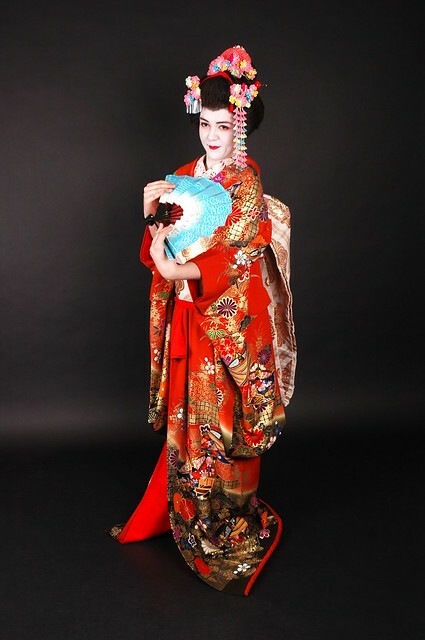 These days maiko and geisha still work hard as entertainers (perhaps harder than ever before, in order to maintain their craft), and can be seen performing for the public as well as at private functions. As well as learning traditional dances and learning to play the shamisen, maiko now learn other instruments and arts, such as shakuhachi (bamboo flute) and calligraphy, making them all-round entertainers. The world of maiko and geisha – the karyūkai (花柳界 / the flower and willow world) – is one which fascinates me. It seems incredible that even today such artists exist, walking around modern Japan in beautiful kimonos, working hard to perfect their crafts. In a way the tradition seems archaic, but it’s one of the remaining things that makes Japan the mysterious place we foreigners often see it as, and it’s the mystery and ‘otherness’ that is the main attraction for most people when it comes to falling in love with Japan. You make a great maiko, Ali! Aw, thanks Fran! (*^_^)v Dressing up was so much fun – I can’t believe it was six years ago! I can’t remember if you’ve done this already, but how about kokeshi? 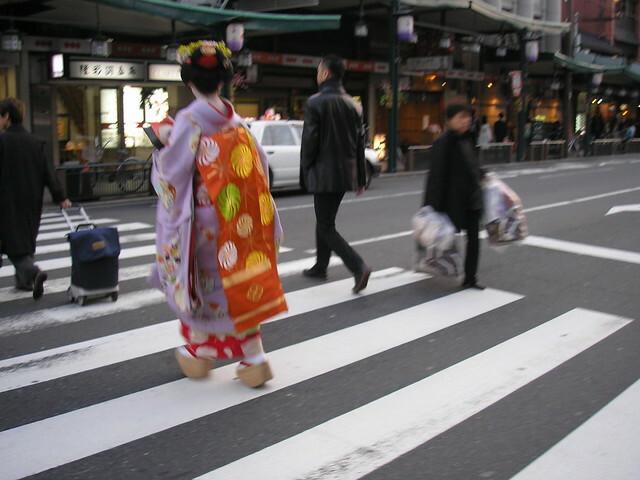 I did a Maiko dress-up in Kyoto a few years ago. You can see the outcome in the avatar I’m always using when commenting. It was a lot of fun. Nice experience that I can only recommend. Damn. Why am I blanking on that? I love your photo and all of your information!